Find the experts in alternative medicine with this extensive contact directory of naturopathic specialists. This list is pre-built and ready for you to download now! Market your healing supplies, techniques, and programs to naturopathic doctors using this database. Sometimes, normal westernized treatments are not the best options for some patients, especially for those with already diagnosed, chronic illnesses. That's why many with more manageable symptoms turn to alternative medicine, such as acupuncture, herbalism, homeopathy, diet and exercise, and other natural treatments. Nature-based “medications" can include anything from herbs to different foods to traditional Chinese remedies. In specialized cases, naturopathy can offer patients a smoother path of self-healing. It helps many patients control their symptoms and monitor their overall health in a more preventative way. Whether you plan to market your herbal product, aromatherapy line, acupuncture supplies, meditation book, or other related products or services, you can reach out to those who may be interested easily with this accurate database of naturopathic doctors. In this data product, you can find a list that contains the alternative medicine experts at numerous institutions consolidated into one resource. 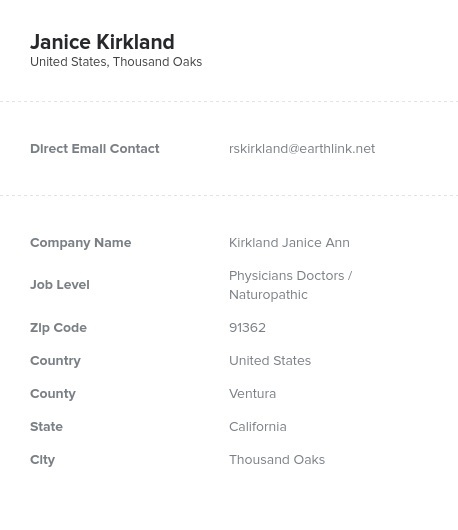 Bookyourdata.com's useful contact information has been organized so that one could easily find the name, title, phone number, email, and other contact information of the experts one wants to talk to. Look up key contacts by buying this file, downloading it, and integrating it into your CRM. The whole process takes only minutes, so start contacting naturopathic doctors today!